Plantar Fasciitis is a micro tear in the tissue bands underneath our feet that starts towards the heel connecting to the metatarsals. Keep reading know more about plantar fasciitis. The first signs of Plantar Fasciitis is a striking pain usually when you take that first step out of bed. The pain slowly starts to go away as you continue walking, however, once you sit down for a short period of time and then get back up, the pain comes back. By this point, if you believe your foot pain can be caused by plantar fasciitis, keep reading to know more about plantar fasciitis. Plantar Fasciitis is common but you could easily avoid with the help of arch supports and good supportive shoes. Unfortunately, if you are like most, you probably didn’t get taught about foot pathologies. Perhaps, you only started to take care of our feet until you began to experience foot pain or starting searching online to know more about plantar fasciitis. We always recommend for you to see a doctor to get an actual a diagnosis of Plantar Fasciitis. Once your doctor determines you have Plantar Fasciitis, they may recommend you get arch supports either custom or over-the-counter. Your doctor may also recommend you get good supportive shoes to accommodate your arch supports. However, some doctors could give their patients an orthotic during their doctor visit. These orthotics tend to be hard which most people say are uncomfortable. The arches in our feet are not the same, so over-the-counter orthotics tend to be different as well. Therefore, we recommend you schedule an appointment for your FREE Foot Analysis. The Free Foot Analysis includes a digital foot scan and pressure mapping of your foot to determine your arch settings and your pressure points. The foot analysis will also include a gait analysis and expert fitting and measurement to get you the most appropriate shoe, size, and width for your feet. 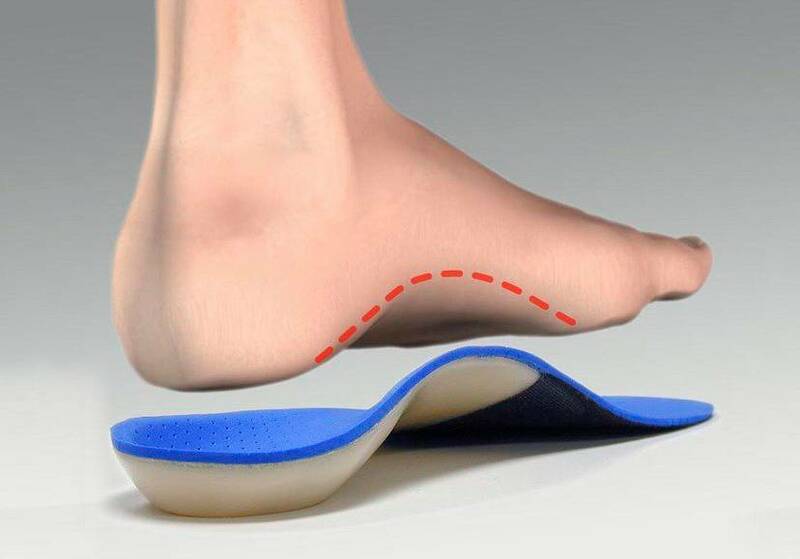 Once a trained Pedorithist determines your gait and foot type, they will recommend the best over-the-counter arch supports or fit you for custom made orthotics. You only get one set of feet, so it’s crucial to keep your feet supportive with arch supports as much as possible. So, when it comes to getting rid of Plantar Fasciitis, arch supports is the first step towards healing. They are great for plantar fasciitis pain, as they help with the biomechanics of your body, provide support for your arches, and help minimize your less stress and fatigue. At our Lucky Feet Shoes stores, we’ve had many customers come in complaining of arch pain. Which were just barely seeing a doctor, to find out that they have Plantar Fasciitis. Don’t wait until the last minute to get seen by a doctor. The earlier you determine the cause of your foot pains, the fewer consequences your feet will face. An example of waiting too long is finding you have Plantar Fasciitis and need to have foot surgery; only because your Plantar Fasciitis worsened. Taking care of it early on you can avoid surgery and get rid of your Plantar Fasciitis on average between 4-6 months. The 4-6 months is the average healing process, however, you will need to keep on track on various healing routines daily in order to heal the irritated tissue bands properly. Where to shop shoes for Plantar Fasciitis? Whether you prefer to shop online or instore, at Lucky Feet Shoes we have a large selection of shoes for plantar fasciitis symptoms. However, if you prefer personalized shoe fittings, great customer service, we have nine comfort shoe stores located in Southern California. Which are located in Costa Mesa, Anaheim Hills, Rancho Cucamonga, Riverside, San Dimas, Long Beach, Temecula, La Quinta, and Palm Desert. We invite you to stop by for a free foot analysis and try our shoes for plantar fasciitis. In addition, we have a large selection of comfort shoes, wide shoes, walking shoes, running shoes, arch supports, and custom orthotics! Therefore, we encourage you to shop in-store for our personalized customer service and free foot analysis! So, schedule a free foot analysis today!